Two tight semi-final affairs, with goals aplenty, see the two sides who finished first and second in the Clausura table take one goal leads (effectively two due to Clausura positioning) into the second-legs to be played midweek. 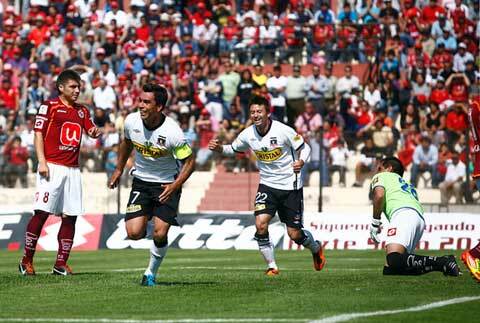 In the first of the semi-finals Colo Colo entertained Cobreloa in what was a topsy turvy encounter full of incident as Ivo Basay’s Los Albos struggle to achieve the consistency required to challenge rivals Universidad de Chile and make a case for winning the Clausura and a place in next years Copa Liberatadores. Cobreloa on the other hand showed, with players of the quality of Nicolás Trecco in tow, why they finished second, behind La U in the Clausura table. Clausura defender Sebastián Rocco had a goal rightly chalked off before Colo Colo took the lead just shy of the 20th minute mark. Quick thinking from Jose Pedro Fuenzalida from a corner saw the midfielder exchange passes on the edge of the box before curling the return beautifully into the far top corner. In an explosive opening to the Clausura play-offs three of the four games went the way of the positional seeding with three away wins. The only home win coming from Universidad Católica who, despite finishing below Audax Italiano, were arguably favourites to win through to the semi-finals. It is looking likely that three of the four semi-final places will be taken by the three Santiago Giants. Saturday saw a glut of goals as 12 were scored in the two games while on Sunday the two encounters were tight and tentative, both away teams winning a goal to nil. The play-offs kick off on Saturday (today) when La Serena entertain Ivo Basay’s Colo Colo at La Portada with the Santiago giants looking to make amends for their humiliating 4-0 loss at the beginning of October. 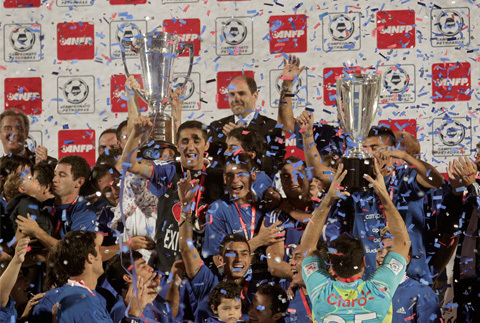 Los Albos haven’t won a title since the 2009 Clausura and despite making plans for next season already will want to be the team to stop Universidad de Chile’s long unbeaten run. They have goals in the side with Esteban Paredes, Carlos Muñoz and Mauro Olivi while Boris Rieloff provides penetration from left-back in a system which is loosely 4-2-2-2. La Serena missed out on the Apertura Clausura by three points but were in little danger of missing out on the Clausura end of season party. A run of two defeats in 12 propelled them to a confident position. Veterans Gamadiel Garcia and Mauricio Salazar link with the impressive Mathías Vidangossy, who has been mooted with a move to Colo Colo, to supply Juan Sánchez Sotelo. La Serena play in the open but colourful La Portada which is due for an upgrade. UC have had an unpredictable yet interesting Clausura season. Yet it all started at the end of the Apertura. Having won the first-leg of the Apertura play-off final away to Universidad de Chile 2-0 they contrived to lose the second-leg 4-1. It did not look to affect them as they stormed through the Copa Chile and were unbeaten in five of the first six Clausura matches. But then their season seemed to uncoil as they lost their next four and were knocked out of the Copa Sudamericana, leaving them on the outside of the play-off places looking in. But a late season rally, including a Copa Chile win on penalties against Primera B side Magallanes, pushed them into 5th place. There are still question marks over Mario Lepe’s pragmatic play especially with the attacking talent at their disposal yet they are arguably Universidad de Chile’s biggest threat. Francisco Silva pulls the strings at the base of the midfield while Milovan Mirosevic, Fernando Meneses, Matías Mier and Felipe Gutiérrez inject spark into the attack that includes the wily but still not old César Carignano and Francisco Pizarro. Also keep an eye out for livewire Kevin Harbottle. Audax Italiano are another Chilean team top heavy with talent and play a fluid 3-4-1-2. They have a number of options in the final third which makes them one of the most interesting teams to watch; Facundo Pereyra is the league’s second top goal scorer while Felipe Mora, Cristian Canhué and Bryan Carrasco add invention and guile. At the back they the promising curly-haired Lucas Dominguez and are captained by national team rising star Matías Campos Toro who covers the whole left-wing and adds a verifiable goal threat. 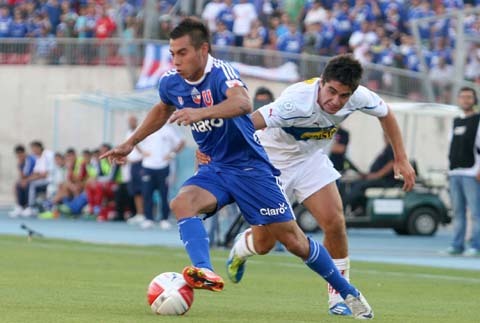 Late season inconsistency will have cost them a Copa Liberatadores place if Universidad de Chile win the Clausura.